In a monumental breakthrough with far ranging implications, cardiologists at the Children's Hospital Boston in Massachusetts have kept suffocating rabbits alive for 15 minutes with injections of oxygen-filled microparticles. The groundbreaking procedure could conceivably prevent millions of deaths each year caused by such things as heart attacks and choking. Developed by John Kheir and his team at CHB, the technique could prevent heart attacks and any kind of injury caused by oxygen deprivation once it's proven safe for human use. It might also be used to avoid cerebral palsy which is caused by a compromised fetal blood supply. Assuming the procedure could ever be developed for use outside of clinical settings, people could use it in the event of emergencies. It could also become part of a first aid kit in anticipation of problems -– a welcome breakthrough for scuba divers and high altitude climbers. The researchers also note that the technique could be used to augment oxygen delivery to at-risk organs, while opening the door to entirely new diagnostic techniques. Outside of medical use, the procedure could also impact on normal human functioning. Swimmers and divers could conceivably take the injections and stay underwater for unprecedented lengths of time. The microcapsules used by Kheir and his team…consist of single-layer spherical shells of biological molecules called lipids, each surrounding a small bubble of oxygen gas. The gaseous oxygen is thus encapsulated and suspended in a liquid emulsion, so can't form larger bubbles. 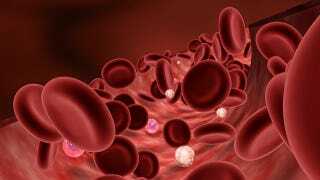 The particles are injected directly into the bloodstream, where they mingle with circulating red blood cells. The oxygen diffuses into the cells within seconds of contact, says Kheir. "By the time the microparticles get to the lungs, the vast majority of the oxygen has been transferred to the red blood cells," he says. This distinguishes these microcapsules from the various forms of artificial blood currently in use, which can carry oxygen around the body, but must still receive it from the lungs. In the experiment, the rabbits underwent 15 minutes of complete tracheal occlusion (their air passageways were blocked), but showed no ill effects during the procedure. He thinks that it might be possible to modify the technique to keep subjects alive for as much as 30 minutes, but doubts that it could be pushed much further. Because the microparticles do not recirculate, it would be necessary to continuously infuse fresh ones into the blood, and there are limits to how much extra fluid can be pumped into the bloodstream. "It's not going to replace the lungs, it just replaces their function for a limited period of time," says Kheir. You can read the entire study at Science Translational Medicine. Image via Shutterstock.com/BioMedical. Inset image via Nature.